With November comes cool weather and all things warm and woolly! Among everything I love to do, knitting is high on my list. I’ve been teaching knitting and crochet classes for over a decade, and always have several projects going at any given time. I love everything about knitting: the anticipation of starting a new project, the way the needles sound together, the portability, the different items that can be made and the delicious yarn! A good yarn and its texture can make all the difference in a project. 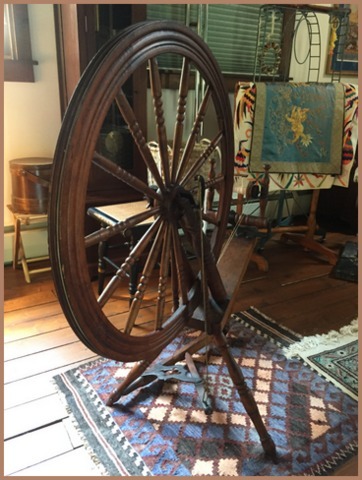 As a child, at my aunt’s house, I would always wander into her front room where she had a large antique spinning wheel displayed. I’d never dare touch – (it was a thing of fairy tales!) but admired with awe! 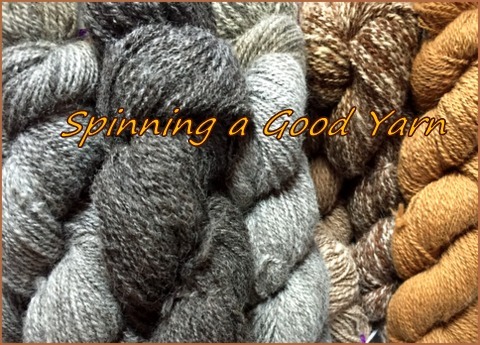 I still think spinning wheels are stunning, but never really knew exactly how they create the intoxicating yarns that call out to us knitters until recently- when I was treated to “Spinning Wheel 101” by a very talented spinner and alpaca farmer. How many times have you said, “When I retire someday I want to live on a farm”? 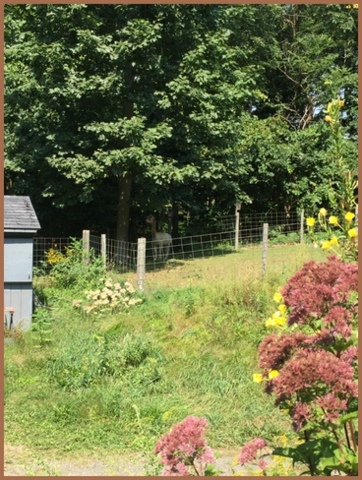 June and Henry Bissonnette are living that dream in Connecticut, having converted the property their home sits on into a beautiful farm where they live with their six alpacas, four cats, and a parrot. 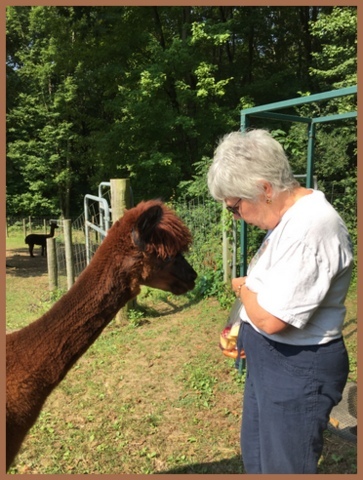 Henry, a fellow Master Gardener, and his wife June were not always alpaca farmers. In 2004, June was two years away from retirement when they went camping with relatives at Lake Champlain. Terrible weather forced them to cancel outdoor plans, so they went to a craft show at the Saratoga Racetrack. There they saw an Alpaca and Llama agility competition. June had never seen alpacas before and thought they were the cutest animals she’d ever seen. It was love at first sight, and June knew right then and there that she wanted to raise them someday. 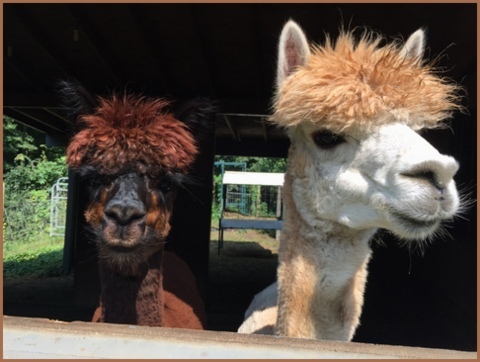 After that, June and Henry could not forget alpacas. 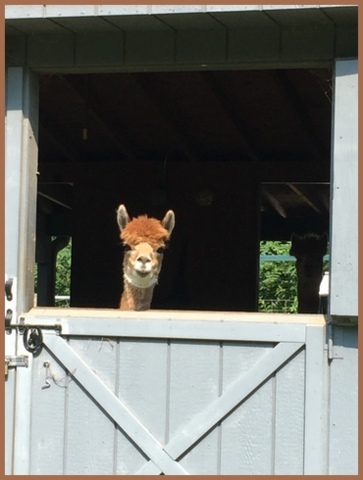 June was a Senior Risk Analyst for GE Capital at the time, so for the next two years, the couple visited an alpaca farm in Ballston Spa, New York, and subscribed to Alpaca Magazine. 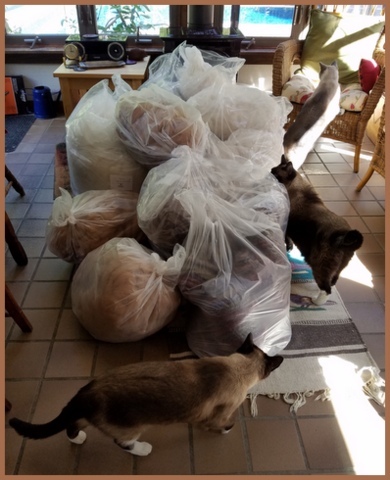 The couple took free time to clear their property of brush, to plant pastures, put up fencing and gather supplies needed to be a working alpaca farm. 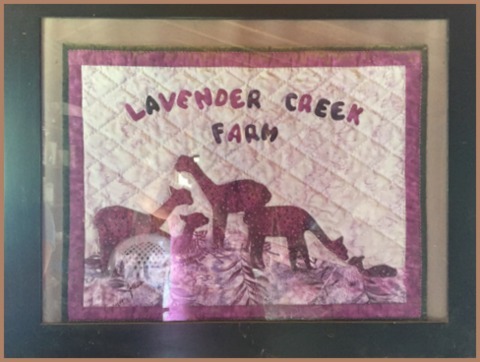 In the fall of 2006, Lavender Creek Farm was born. 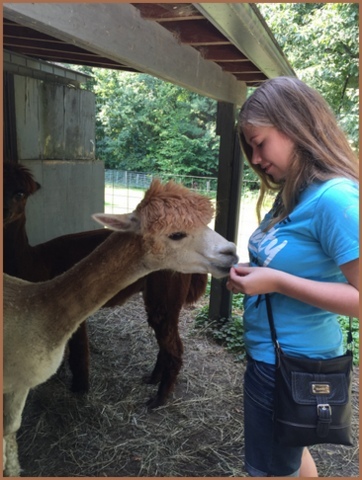 Henry and June started with three alpacas and currently have six that call Lavender Creek Farm home. 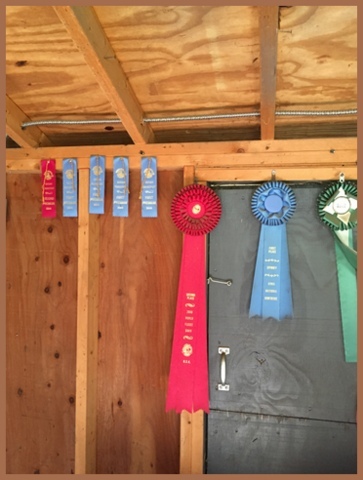 They didn’t plan on that number, but have had babies born on their farm and adopted from friends who were downsizing. Audrey enjoyed our visit, and loved feeding treats. 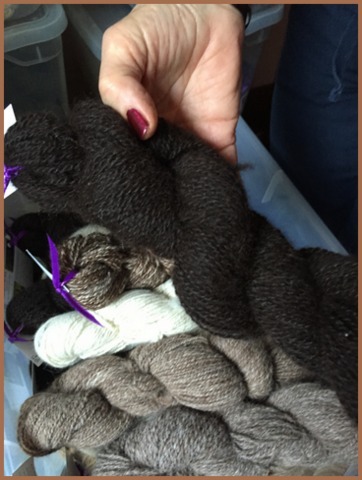 What makes alpaca wool so special (and pricier in stores than other fibers) is that alpaca wool has fine “scales”. Scales hold fiber together. Alpaca has fewer scales than wool, so it has more of a feeling like fine cashmere. 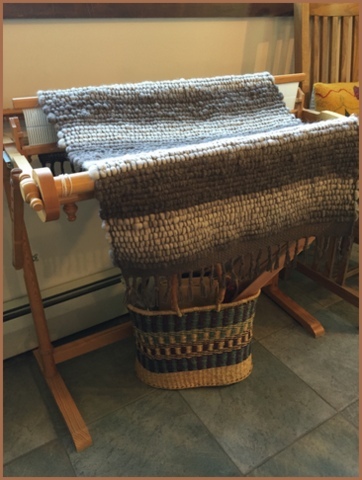 The final product of alpaca is a hollow fiber, lighter than wool, that is stain resistant and hypoallergenic. The firmness of a fiber is the micron count. The micron count of wool-bearing animals ranges from 21 – 30 microns. Cashmere has 12 microns, while alpacas having a count of 12 – 30. 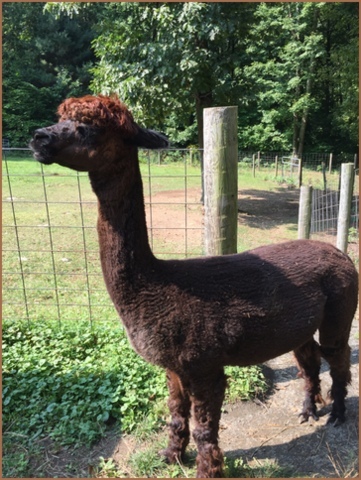 Juniper and Darcy, younger animals on the farm, have counts in the low 20’s, while Siobahn, an older alpaca has a count of around 30. To process their animals’ wool, they shear the “blanket” across the back. This is known as “firsts”, which is the best, finest and most uniform of fiber. 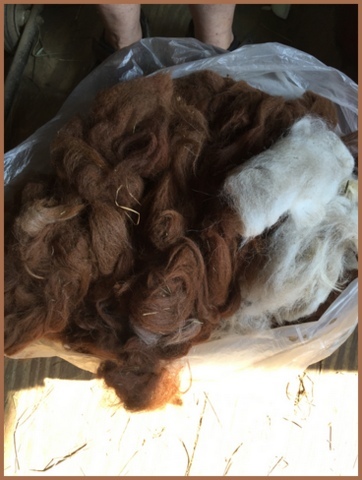 It is then sent to a local mill for washing and carding and finally made into roving. 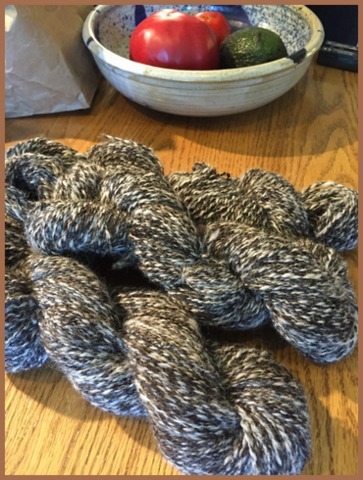 “Seconds” are made into rug yarn using alpaca-wrapped wool cord blended with wool to help shorter fibers hold together. 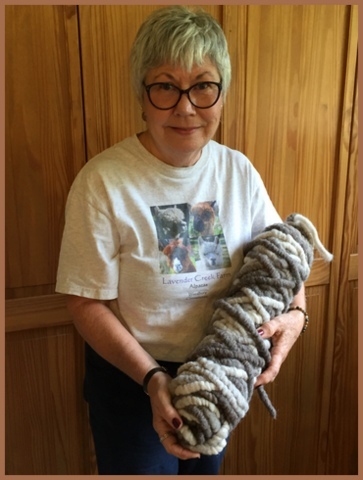 Now a talented spinner who knits, crochets and weaves, at first, June could crochet but did not know how to spin or knit. She called a local spinner who gave her a lesson. 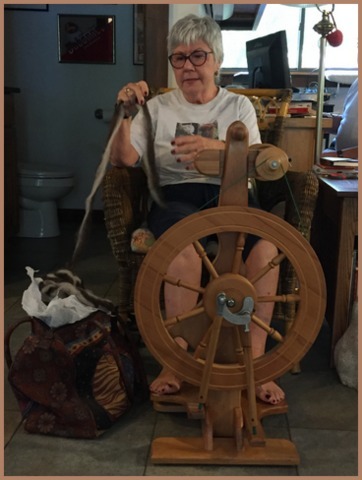 June ordered her first spinning wheel and has now been spinning for ten years. 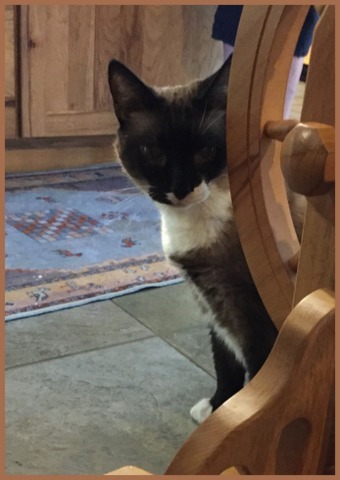 When you walk through the front door of their beautiful home, visitors notice two things: the couple’s adorable, pure-bred adopted Snowshoe Siamese kitties, and a big, stunning, wooden antique spinning wheel, known as a “Michel Cadorette”. 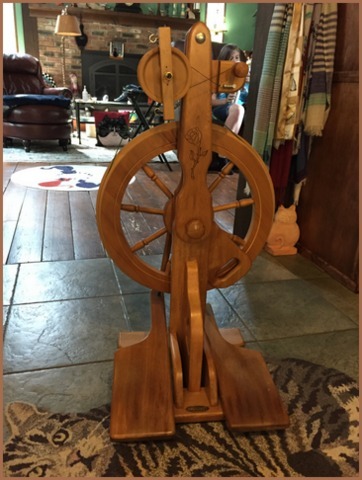 Made in the 19th century by the well-known Canadian spinning wheel maker, this model is a single treadle. 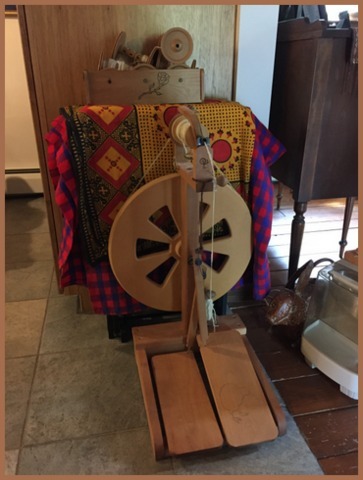 Spinning wheels were prolific in Canada in the 1800’s because all materials were spun in cottage industries. This model has tiny bobbins and spins fast, producing a very fine yarn. Modern spinning wheels are not as large. Still beautiful, they take up much less room. 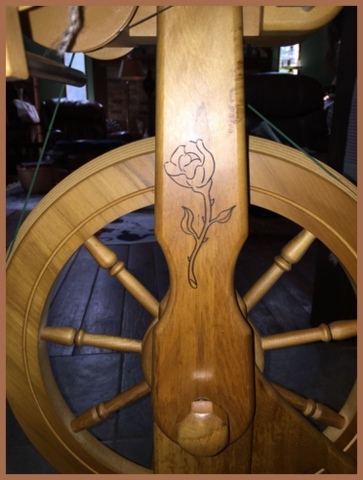 June’s first wheel was an Ashford “Kiwi”, made in New Zealand. This is a good “starter” wheel. 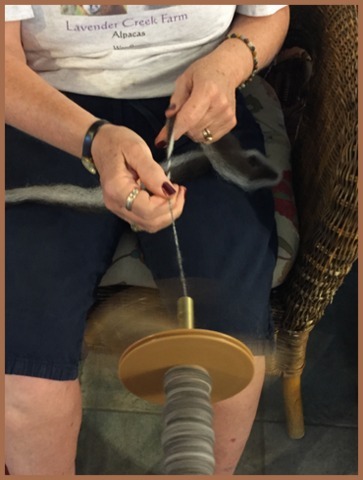 June says it “takes practice, practice, practice” to get the hang of spinning a good yarn. “You can take 100 lessons, but the way you really learn to spin is you practice.” The hardest thing to learn is consistency. Lumpy yarn becomes like “boucle”. 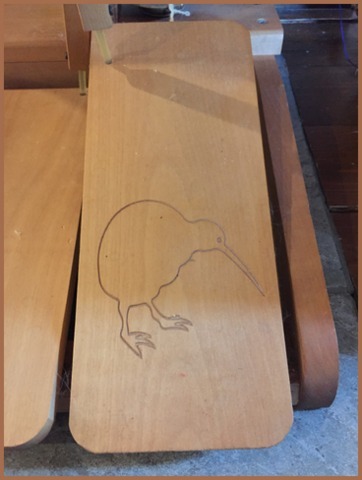 The “Kiwi” is a basic wheel style called a “castle” because of the direction of the wheel. 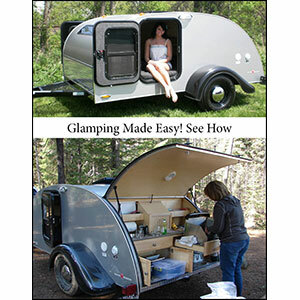 It takes up less space and is a double treadle. 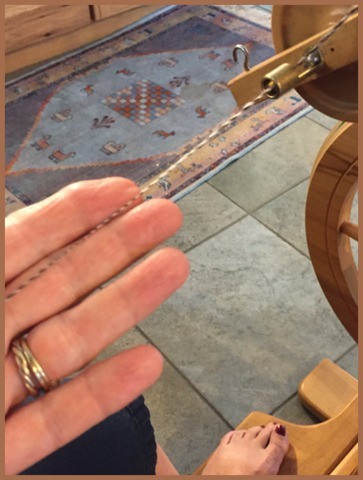 Treadling at a high speed results in a fine yarn, low speeds create thicker yarn. 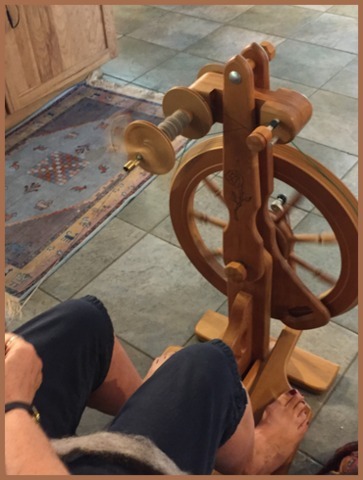 Thickness is also affected by how fast you treadle and how fast you “draft”, or feed the fiber into the wheel, and also by how much you draft. “Ratio” of a spinning wheel refers to how fast you can spin. First, you “spin” in one direction, next you “ply” it in another. 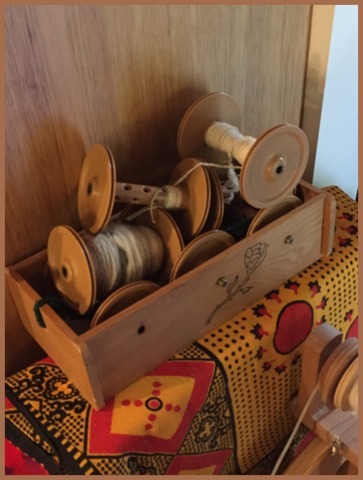 A “lazy kate” is used to hold multiple bobbins while the yarn on them is wound off, twisting the fiber together so it becomes “2 ply”; it keeps spools or bobbins in place while spinning the yarn off of them. A “knotter” is used after the spool is full, making yarn into a skein. 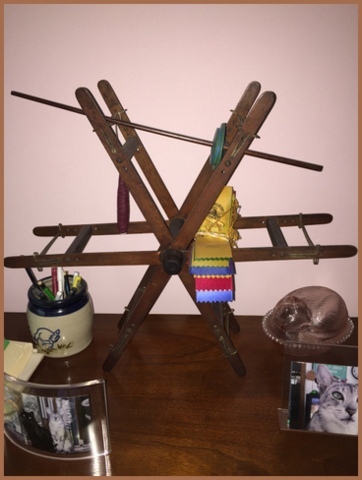 June’s Lazy Kate sits with various bobbins that go with her “Rose” spinning wheel. June’s main spinning wheel is also made in New Zealand. Called a “Majacraft Rose”, it folds up and features 27 different ratio settings. June says spinning is relaxing, and after ten years can watch television and spin, as she spins now by “feel”. I find knitting to be relaxing, too. I always say it is “my yoga”. (I can’t do yoga. I can’t stop thinking of things like my grocery list, and I have never been that flexible no matter how hard I try. Last time I tried, I lost my balance and fell through drywall). So I knit. Now, when I hold that soft, hand-spun sumptuous ball of color, I will have a new appreciation for how it came to be.